I read Bob’s recent post on the nomination of Elena Kagan to the United States Supreme Court and I was quite happy to see the president nominate another woman to our highest court in the land. Bob’s post mentioned that there is diversity of race and gender on the court, but I guess I don’t feel that there is enough diversity on the court. 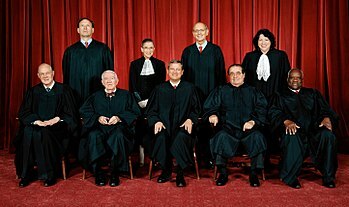 Women make up 51% of the population of the United States, yet on the Supreme Court there have been no more than two women serving on the court at one time and currently there are seven males. That just doesn’t sit right with me and that’s one of the reasons I am supportive of the president’s nominee. The other reason I am supportive of Elena is because of the fact that she is a single person and her sexual orientation shouldn’t be an issue as to whether or not she sits on the court. I happen to be a single person and like being single thank you very much. I have to say I have a sense of what she must feel like though. I found this article which I think touches on what it means to be a single person in America today. The comment Elena’s mother made to their neighbor after Elena was appointed Dean of Harvard Law School particularly hit home with me because rarely does a holiday pass where my mother doesn’t make a comment like “I would find someone and get married”. So I hope that Ms Kagan’s personal life isn’t made to be an issue by the Republicans during the hearings and that she is quickly confirmed. If they do I think their making a big mistake.